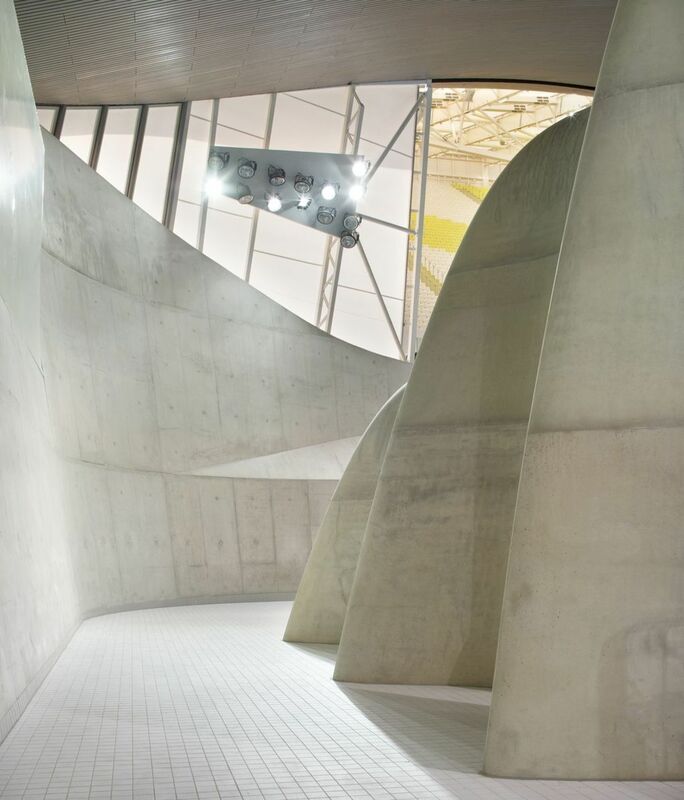 Zaha Hadid Architects’ new London Aquatic Centre offers an opportunity to reflect on the Iraqi architect’s poetics and the way she has overcome unique ways of conceiving of known building types. Zaha Hadid’s concept of space is expressed in all her projects, from her best-known museums to this sports facility in London’s Olympic Village. Years ago critics all over were talking about the emergence of a common language among the archistars based on the relationship between designing an object and designing a building. While anyone who claimed that the two methods were similar attracted a lot of criticism at the time, this approach has become the norm today, to the point that it is often identified with the name of the world?s best-known woman architect, Iraqi-born Zaha Hadid. While leaving it up to others to judge her merits, aware that there is no better judge than history, we shall limit ourselves here to describing her latest new project in London, the Aquatic Centre built for the 2012 Olympics on the southern side of Stradford Park, and offering some food for thought. 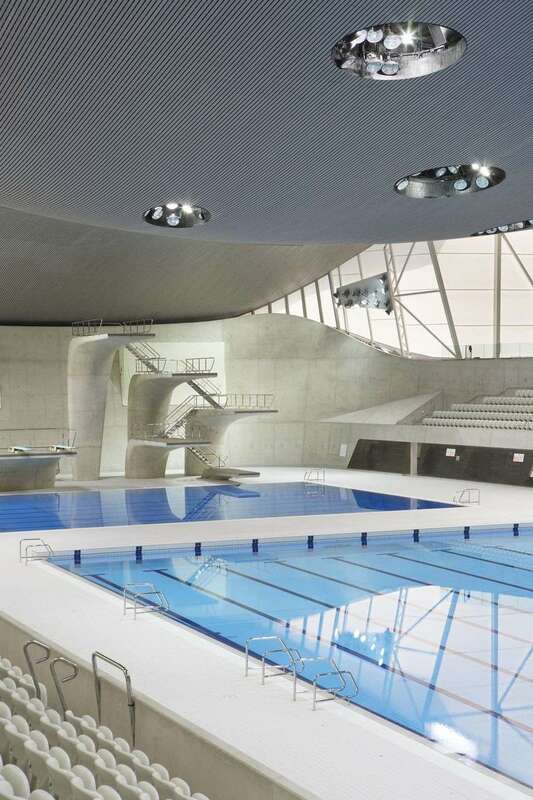 The massive concrete structure topped by a heavy roof of parabolic arches which protects and magnifies the Olympic pools has nothing to do with the metaphor of water, as one might think in an initial, superficial reading. The idea of compositional fluidity, or deconstruction, to use the term normally applied to this form of expression, is inherent in all Hadid?s projects and it would be limiting to seek to justify the vocabulary used in this project as a direct reference to the building?s use. Zaha Hadid has done away with the principle of the main façade of a building; all sides of her constructions are equally important. The image of the fluid expresses this intention, revealing the dynamism and subjectivity of visual experience. From whatever point of view we look at her buildings, they appear different, modified, changing: just like an object, of which it doesn?t make sense to say this is the front and that is the back, as the human body interacts with all its sides. In projects such as the Aquatic Centre, the Maxxi in Rome or the BMW central building, the architect shifts the focus of interest from the relationship between building and landscape (the point of view of a person moving away from the building towards its surroundings) to the external user or observer?s relationship with the building. There is less interest in the building?s surroundings, which no longer univocally condition how it is built. In the absence of any relationship between the building?s compositional function and the place in which it stands, architecture no longer needs to express its identity on the outside: there is no element in Zaha Hadid?s projects which allows the observer to recognise what type of place is contained inside them, so that a museum and a sports facility may be built with the same vocabulary. Despite this, the building still has a primary interest in the life of the city, found in the emotional relationship between the user and the building. Immediate, emotional and attractive, the new architecture speaks a language common to all: the language of the media.